Leviticus 11:3 You may eat any animal that has a split hoof completely divided and that chews the cud. Leviticus 11:8 You must not eat their meat or touch their carcasses; they are unclean for you. Isaiah 66:17 "Those who consecrate and purify themselves to go into the gardens, following the one in the midst of those who eat the flesh of pigs and rats and other abominable things--they will meet their end together," declares the LORD. Touch That Bacon, Burn in Hell! Christians in the modern world are constantly faced with challenges to their piety and holiness. If it's not one thing it's another. Temptations such as cotton/polyester blends, women's unholy private parts, popular hair styles, tasty shellfish dishes, claims that children should not be beaten, and arguments in favor of equal rights for gay people are constantly challenging people of faith. But one of the most terrible dangers to your holiness comes in the form of certain tasty, salty meat treats. 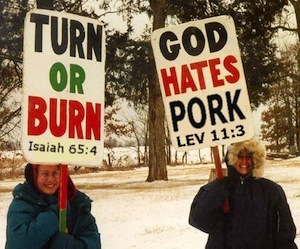 God Hates Pork! When a True Christian™ enters a supermarket Satan is there waiting, trying to trick you into buying pork and pork products. The devil wants you to buy bacon, he wants you to munch on pork rinds, he hopes you'll eat pork chops. Some so-called Christians even eat Ham on Easter Sunday! Christians living in the US have made great progress in recent years in their efforts to align our laws with the Book of Leviticus, especially with anti-homo laws, but we must do more if we are to remain the Official Nation of Jesus H. Christ. We need to outlaw the sale of pork and products derived from pork! 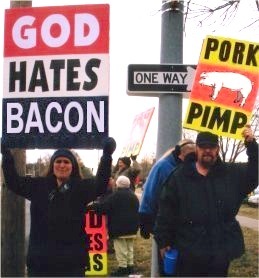 Help to defend the Sanctity of Foodstuffs by donating to the God Hates Pork foundation or by picketing outside any supermarket that offends our Lord and Savior by offering bacon or bacon flavored foods. If a politician eats pork be sure you campaign against him! We don't want God to pass judgment on his official nation because of bacon eating heathens.